Few debates rage as contentiously in American life as the question of who serves the best coffee. If you’re from the Midwest, your answer may be a clear “Tim Horton’s”. You may be a Dunkin’ Donuts snob if you’re from New York. And if you’re from Seattle, we all know that you might be a Starbucks fan. But more and more each year, Americans are looking to get their coffee fix from home-brewed coffee machines. For many people, it’s a cheaper, more accessible, and generally better-tasting alternative to that $6-per-day latte. The growth of micro-beaneries is proof that Americans are longing for the earthy, fresher taste of the coffee their parents used to drink in the morning. And all of this begs the question: who makes good coffee makers? Cuisinart certainly does. A household name since 1971, Cuisinart appliances have graced American kitchens in every shape and form from food processors to – you guessed it – coffee makers. And the consensus is in: their coffee makers are not only affordable, but good! So good, in fact, that our readers have clamored for a look at which Cuisinart coffee makers are worth their money. Let’s get to it! Coffee lovers rave about this coffee maker. In its design, Cuisinart appeals most to radical coffee drinkers. (Sound familiar?) Its glass carafe holds up to 14 cups of coffee, and it even has an “Extreme Brew” setting for users that like their coffee bolder than bold. Not only that, but this model now rocks a sleek stainless steel finish on both the front and sides, making it the perfect accessory to any modern kitchen. With upgraded LED lighting and controls (no more switches, only push buttons), it’s no wonder this maker nabs the top spot as our pick. The DCC-3200 has a “Clean” button that lights up red when it’s time to decalcify and clean the machine, an easy process fully detailed in the Cuisinart instruction manual. Economical coffee drinkers will also love its bold-flavored brewing option, which will save them money in coffee grind costs annually. The ingenuity of this coffee maker doesn’t stop there. Perhaps the most impressive function of this Cuisinart model is the customizable hot plate setting. Users worried that their coffee will burn can set the hot plate to phase off after a desired period, which also helps prevent it from rusting. For you alarm snoozers, this is the first Cuisinart coffee maker that lets you silence the “coffee done alarm” – a long-awaited innovation. Each unit comes with a state-of-the-art Cuisinart gold-tone coffee filter, which lets you brew coffee without a paper filter. Even better, this model introduces several technological traits that eliminate leaking – a major problem among other brands’ coffee makers. Ergonomically, the DCC-3200 introduces several improvements. Its lid easily pops on and off for easy cleaning and filling, with a larger water hole. Its water tank is now transparent, which means no more guessing how much water is inside the unit – you can see it from outside! Overall, Cuisinart has pulled together years of user feedback and engineering to create a versatile, advanced coffee maker in its DCC-3200. Like any machine, the Cuisinart DCC-3200 has reported disadvantages. For one, users claim that the first few brews by the machine can produce a very plastic-based smell and taste. As a solution, some users have reported that brewing a pot with vinegar or baking soda can get rid of the smell, but that by the fourth or fifth pot, the smell is gone. 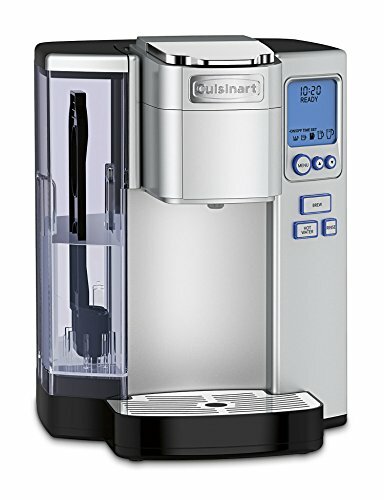 Some users have been critical of the machine’s circuitry, but have mentioned that Cuisinart’s warranty is normally responsive to any issues and willing to replace machines with great attentiveness. Most users contend that the machine is reliable and have gotten 2-4 years of service from theirs. Others have had to replace their hot plates due to rusting within 12 months. Technically, the coffee industry defines a cup of coffee as six ounces. 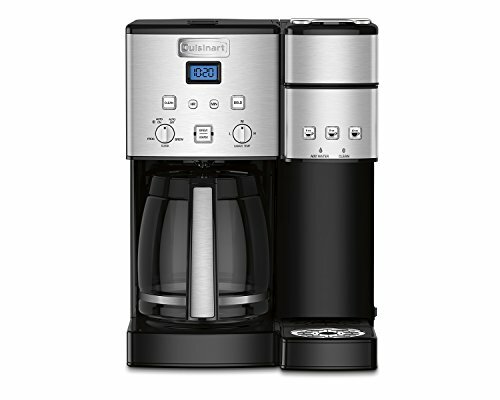 This machine uses a five ounce definition in its determination that the Cuisinart DCC-3200 coffee maker can make 2-3 cups. Though coffee drinkers nationwide are flocking toward the money-saving solution that is homebrewed coffee, not all are looking for traditional filtered coffee makers. The Keurig revolution has created a new demand for single-serve coffee makers, and Cuisinart wasted no time creating its own product to rise to meet that challenge. The Cuisinart SS-10 single-serve coffee maker is mainly known for its speed. Coffee begins to brew within 60 seconds after turning the machine on, which is markedly faster than its competitors’ times. In addition, the machine is much quieter than most single-serve alternatives. Yet another sign of Cuisinart’s engineering pushing it ahead of its peers. A standalone hot water option allows for the making of oatmeal, soup, and tea. Not unlike the Cuisinart DCC-3200, this machine also has a sleek stainless-steel finish – a trendy touch not lost on many of its users. It also comes with a fillable filter that allows users to brew their favorite coffee, and even has a compartment on its right side so that it doesn’t get lost. A noticeable size reduction occurred in this iteration of the Cuisinart single serve coffee maker series. The unit can easily fit into a smaller-sized cabinet, and has a smaller-sized water pump to minimize noise during its short brew cycle. Despite this, Cuisinart created its water tank to hold over 72 ounces of water, which makes this a 12-cup coffee maker. Electronically, the SS-10 has abandoned dial-switches and pursued push-buttons only. Its clock LED is very large and bright, meaning the time and settings can be seen in dark accommodations. Like other models, it contains a timed on/off feature, so that can coffee can be brewed at a specific desired time to fit into a rushed morning routine. 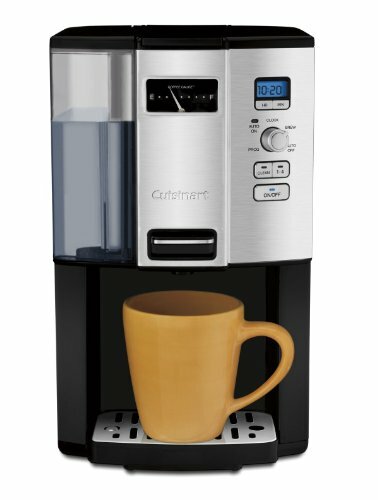 Modern and smart, the Cuisinart SS-10 coffee maker is our pick for top single serve machine. A select few users have reported that the Cuisinart SS-10 Coffee Maker has issues with its puncturing mechanism. For those of you unfamiliar with what this means, the way that K-Cup Single Serve technology works is that a needle punctures a hole into the plastic K-Cup at the top and bottom, and then hot water is blasted through those holes to brew coffee at the optimum temperature. According to these users, the puncturing mechanism is imprecise, and the result is the occasional spillover of water and coffee grinds. In aesthetics, some users have reported that, without the right upkeep (cleaning), the stainless steel can look cheap. Other users ignore this. We’re living in a time where people drive to Whole Foods to pick up organically-sourced coffee beans. It only makes sense, then, to see what Cuisinart has to offer regarding coffee makers with grinders. Of those options, we recommend the Cuisinart DGB-900BC Coffee Maker. Equipped with a high-quality grinder, the machine is fully-programmable electronically with a streamlined and simplified LED menu system. The stainless-steel carafe it comes with is both good-looking and sturdy, with a wide spout for serving the beverages it contains. Its composition helps in keeping coffee hot for hours at a time without depending entirely on a hot plate. The machine contains a charcoal filter for ultimate water purification, which prevents the coffee from chlorine and other contaminants and preserves the best possible taste. Geared mainly toward bean-lovers, the hatch that holds the beans is sealed tight and does a good job of keeping moisture away from unground beans. The bin for coffee beans holds a whole 8 ounces, which is enough for a week’s worth of coffee if you brew a pot every morning. Unsurprisingly, it also has a coffee strength setting to get the most out of those beans! Some users have complained that the Cuisinart DGB-900BC Coffee Maker has a bean hatch that is too hard to keep clean. They say that, due to the heat of the coffee maker and the grinding of the beans, the plastic container becomes faded quickly and loses its clear quality over time. Furthermore, the noise of the grinding beans can be relatively loud just after waking up. Others say that the grinder is designed so that ground coffee from the previous pot can make its way into the current pot. The grinder itself is said to be too aggressive in its use of beans, but that has been disputed by its proponents. Now, this machine is truly special. 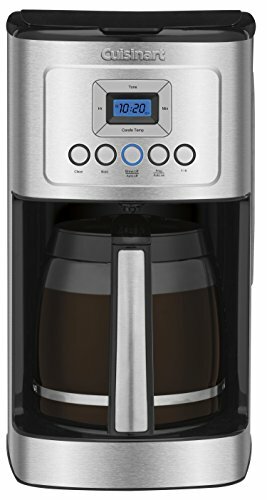 Taking the best features of the Cuisinart SS-10 and the Cuisinart DGC-3200, this is a single-serve and 12-cup coffee maker, like the Keurig 2.0. With three single-serve settings (6, 8, and 10 oz) and the ability to brew 12 5-oz cups of coffee, this powerhouse of a machine can and does satisfy all your homebrewing needs. In a recurring theme with the other models listed, Cuisinart has unique hot-plate controls to avoid coffee burning. In the Cuisinart SS-15 Coffee Maker, however, you now have three unique temperature options to keep your hot plate at. Innovating even further, this model has a power-loss backup system. It means that your settings aren’t lost in the event of a power outage. Smart technology allows the machine to notify you when it needs to be cleaned. (More on cleaning all these machines later.) In the event something goes wrong, you have a switch available to stop the coffee mid-brew. Though a very comprehensive, all-in-one solution, critics of the Cuisinart SS-15 have said that this iteration of the machine has inherited the puncturing deficiency from the Cuisinart SS-10. Others say that the single-serve side can stop working after a few months’ use and advise purchasing the warranty. If you’re looking for a no-frills coffee maker to save you time and energy in the mornings, then look no further: the Cuisinart DCC-3000 coffee maker was designed with you in mind. The design behind this product is peculiar. It’s a coffee machine that brews coffee and has a reservoir with a pour button, so you can serve yourself more coffee whenever you want, like an office water cooler. It contains a gauge that shows the level of coffee left and has a removable drip tray to fit taller travel mugs. Complete with a reusable gold tone filter, coffee scoop, and clean setting, the DCC-3000 coffee maker contains the standard Cuisinart arsenal of accessories. Unlike the other four Cuisinart coffee makers we’ve talked about so far, though, this one does have a knob instead of a fully digital-button setup, but has an hour and minute button pair to set the machine’s clock. An innovative light comes on when using the lever to pour coffee so the user can see how full their cup is at any time. The DCC-3000 comes equipped with Auto-On and Auto-Off settings, so you can set the coffee maker to brew the night before and turn off if you forget about it after brewing. It’s also one of the only Cuisinart machines that is entirely dishwasher-friendly once disassembled. This machine is optimal for coffee drinkers that are tired of chipped or broken carafes since it has none. Overall, it’s a good fit for most basic coffee drinkers, particularly those that don’t mind parting ways with the pot-pouring tradition. The Cuisinart DCC-3000 coffee maker has received a few complaints from some users about leaking, packaging, and the lack of multiple heat settings because of the absence of a hot plate. It is the opinion of the writer that, when considering the purchase of a coffee maker, a warranty should always be purchased. There are several reasons for this. Though the American electrical grid is easily one of the world’s most reliable, different communities, neighborhoods, and houses have different susceptibilities to brown-outs and black-outs. Whenever a plastic-based machine is subjected to high temperatures, water, and electricity, as well as differing levels of maintenance, problems can happen. It is worthwhile to remember that this goes for all coffee makers, not just Cuisinart Coffee Makers. The writer has experienced issues with Keurig coffee makers, Cuisinart coffee makers and Hamilton Beach Coffee Makers. Warranties rarely exceed 20% of the purchase price of coffee makers, and considering the heavy use a relatively low-cost machine can be put through at the residential level, protecting your investment is a wise decision. It is no secret that coffee makers require maintenance, and you should keep this in mind before purchasing a coffee maker. McDonald’s, for example, has some of the most rigorous coffee quality control standards of the entire industry, and requires what can easily amount to hours of weekly machine maintenance and testing per week. Many factors go into coffee quality. 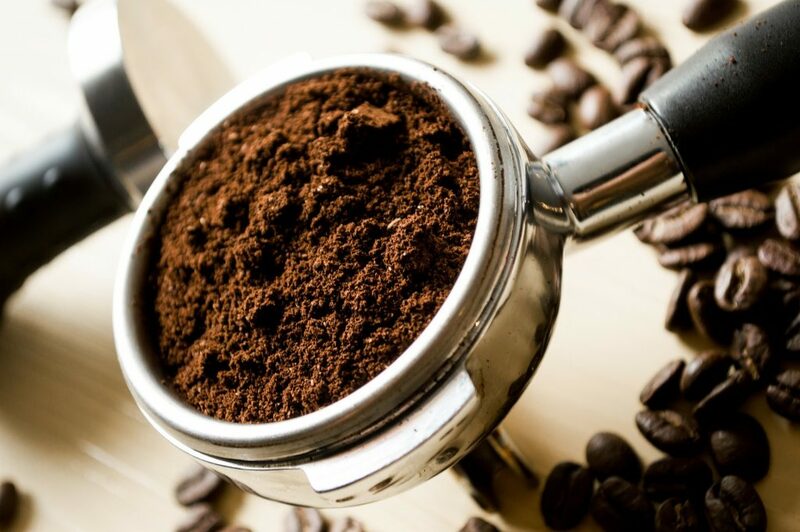 Did you know that grind thickness is a metric used by Starbucks and McDonald’s to measure a coffee’s quality? The blades of a grinder dull very quickly and easily and must constantly be adjusted to ensure that coffee grinds are of the right thickness and consistency. Nothing affects your coffee more, however, than the cleanliness of the pots and machine itself. Every Cuisinart coffee maker manual contains information on recommended upkeep and cleaning. If you’re a serious coffee drinker, you would do well to follow the instructions! Most coffee maker cleaning doesn’t go far beyond cleaning the brew basket with a scrub brush, soaking a carafe/coffee pot in hot water with special cleaning tablets (some use vinegar), and wiping down a hot plate once it’s cooled. These small upkeep tasks go a long way over a long period of time. It is extremely important that, once the machine has cooled, the hot plate is wiped down and left totally dry. Rusting hot plates is a common problem among coffee makers, and the most common culprit is residual, hot moisture. 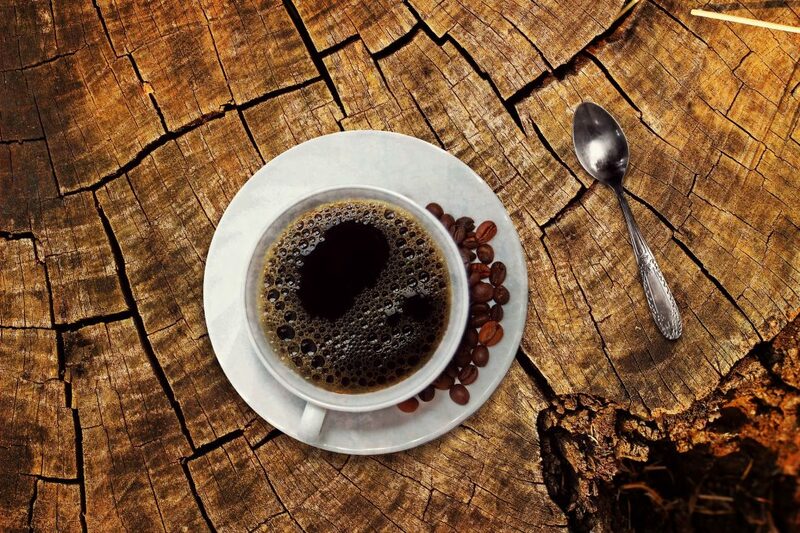 Don’t forget that old coffee grinds and old coffee pose hygienic risks, as well. Never drink old yesterday’s coffee by re-heating it in the microwave. The costs are negligible when you consider the potential damage to your health. Cuisinart coffee makers (and others) advertise that their carafes are dishwasher-friendly. For the busy commuter on the go, this sounds like a great advantage. Let’s look at it in the context of these coffee makers. The carafes are designed in a way that, unless shaken upside down rigorously, residual coffee will be trapped. This means that you might run a load in the dishwasher and see coffee residue mixed with soap on the inside of the carafe when you go to take it out! We recommend handwashing all equipment on Cuisinart coffee makers. This series of Cuisinart coffee makers collectively have one potential disadvantage: the machines are reportedly very steamy. For those of you with kitchen cabinets sensitive to moisture, the machines should not be used directly under them. This can cause the wood to rot and deteriorate. If you have no counter space to move the machine forward and brew, a purchase may not make sense for you. If you were to ask us, “Which one of these machines would you recommend without knowing anything about the person asking,” we would recommend the Cuisinart DCC 3200 Coffee Maker. It is the most balanced of the options, the most technologically developed, and the best-equipped machine to serve the American coffee drinker. 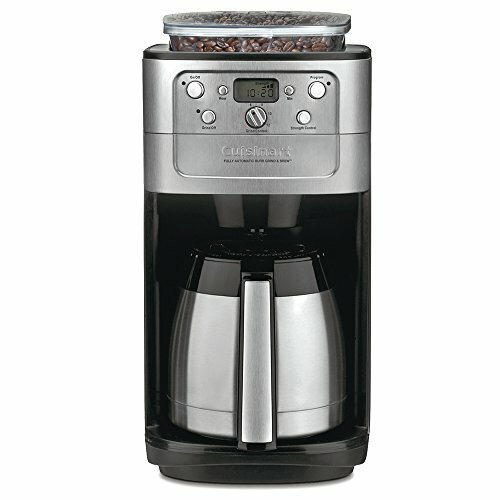 The learning curve of Cuisinart coffee makers, unlike most espresso machines, is extremely easy to overcome. Its 14-cup capacity, while technically not so much because of the 5oz serving size, still is plenty to entertain company or a big family’s coffee needs. Its seamless menu and switch-free controls put it light years ahead of its clunkier, less user-friendly competition.